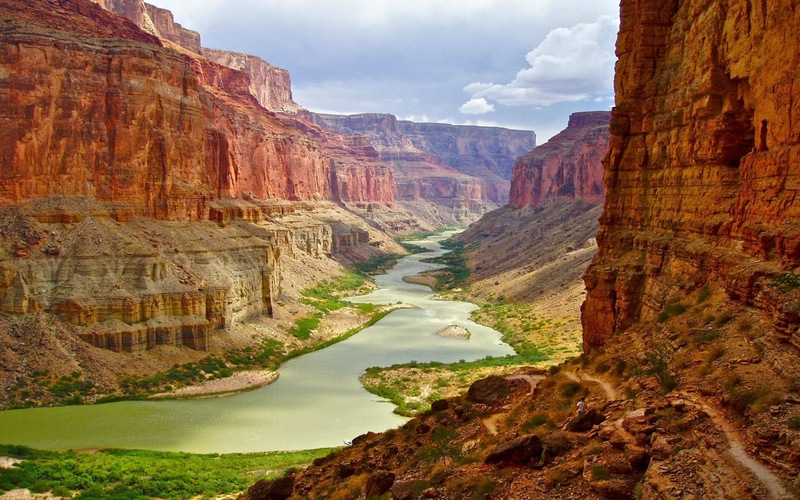 The Grand Canyon of Arizona stands tall in the mind as the Colorado River carved itself into 6000 feet of rock. 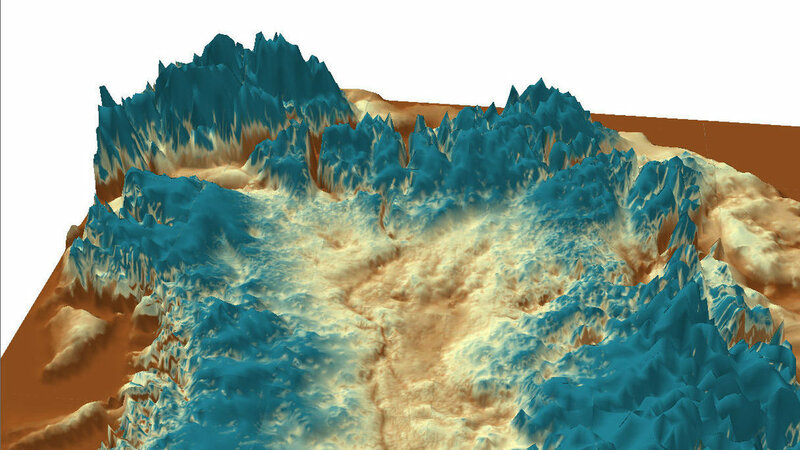 A similar canyon has been discovered in northern Greenland near Petermann Gletscher. 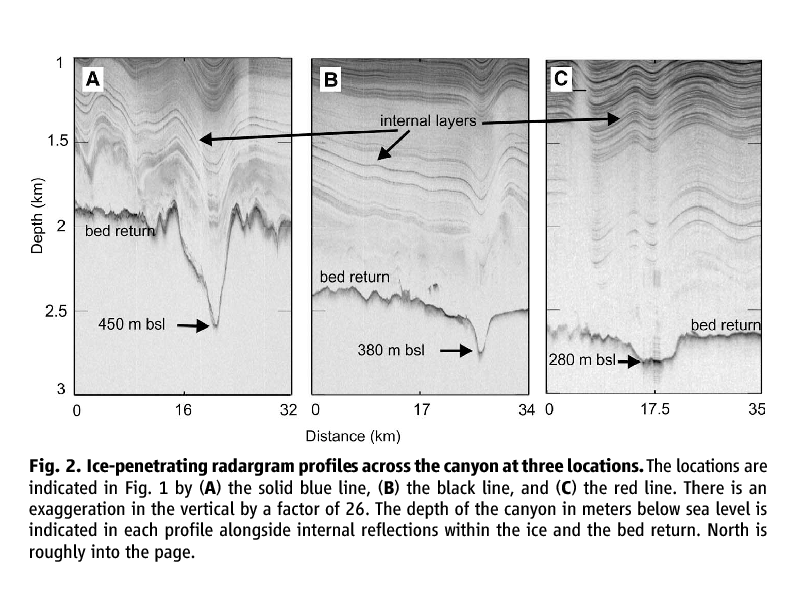 The canyon without a name is buried under 6000 feet of ice, but its size and scale “… are comparable with parts of the Grand Canyon in the United States in terms of width and length and, in its deepest region, are about half of the Grand Canyon’s depth.” These are the words of its discoverers led by Dr. Jonathan Bamber published today in Science magazine. Plateau above Petermann Gletscher in 2012. View is towards the south-east. Floating Petermann Gletscher looking upstream towards the Greenland Ice Sheet in the background. Sigurd Berg Glacier discharging into Petermann Gletscher in 2012. 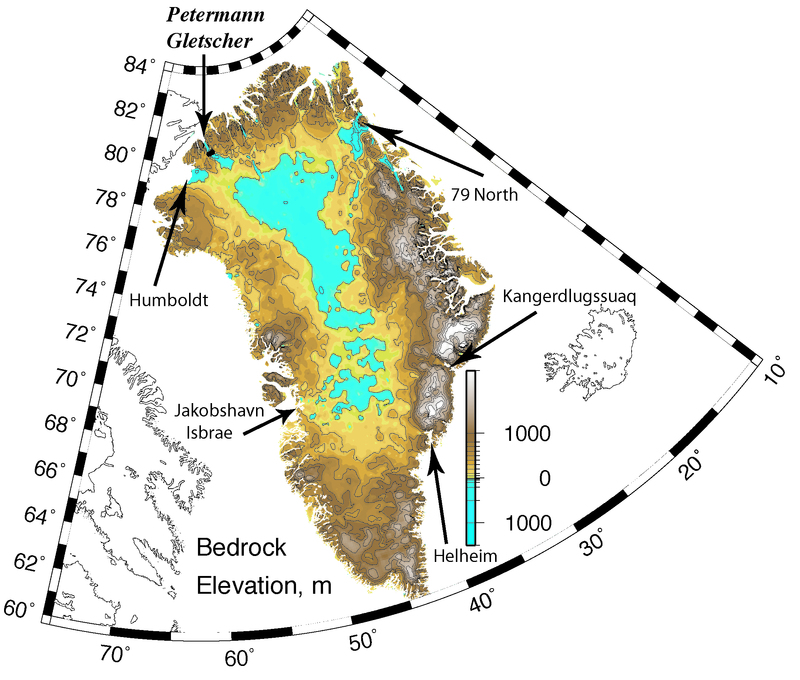 Greenland’s bed-rock elevation from Bamber et al. (2003) digital elevation model based on remotely sensed surveys of the 1970ies and 1990ies gridded at 5 km resolution. Now why is this important? First, it shows how little we know of our own planet when Grand-Canyon style features are discovered as we speak. This should encourage students to get into science, mathematics, or engineering to become future discoverers. Second, this canyon potentially connects the interior ice-sheet, its plumbing, and melt water to Petermann Fjord. It offers new ways to think on how Petermann-like glaciers fit into the climate system: The fastest-flowing of Greenland’s glaciers, Jacobshavn Isbrae, has such a canyon and it accelerated after it lost its ice-shelf the last few decades thus pushing much ice from land into the ocean which raises sea-level. And third, this canyon and the freshwater it delivers to the ocean below Petermann may create the channels under the floating ice-shelf of Petermann Glacier where the bedrock, the ice, and the ocean meet. This explanation differs from an alternate one, that is, the ocean enhances ice-shelf melting in the form of sub-glacial channels. Either ways, it is fun and exciting to report discoveries, but even more so to make them on your own. Lets get started. This entry was posted in Greenland, Petermann Glacier, Polar Exploration and tagged freshwater, glaciers, Greenland, NASA, Petermann, physics, radar, sea level rise. Bookmark the permalink. It will be interesting to see that map/data from Jøkelbugt and Dove Bugt? Those regions are included in the above map. Furthermore, the data are public and can be accessed at the University of Kansas at https://data.cresis.ku.edu/data/rds/ with substantial support from the U.S. National Science Foundation. Yes also note it is turquoise blue in Storstrømmen and L. Ibstrup area, in the map From Bamber et al. (2013).